Home Equestrian Life Let’s Hear it for the Ever Faithful Barn Dog! Let’s Hear it for the Ever Faithful Barn Dog! If you have a horse or ride a horse, chances are you also have a dog. It seems like horses and dogs have been coupled together for centuries. Stroll through any art museum and there in the portraits of patriots and kings, heirs and huntsmen, you’ll see not only depictions of glorious steeds but also images of the owner’s noble canine companion. Dogs have also been workmates on ranches and farms, right alongside draft horses and cowponies. That’s why any horse person can point to the critter in the front seat of their pickup truck and say, “Oh, that’s my barn dog,” and everyone will understand the connotation. Certainly, some breeds are more amenable to fulfilling the role of barn dog. No one can deny the innate herding abilities of an Australian Shepherd, a Queensland Heeler, or a Border collie. Want some help coaxing a recalcitrant colt up the ramp and into the horse trailer? Any of these breeds would be more than happy to oblige. If rodents are threatening to overrun your feedroom, any of several terrier types are eager to ferret out the furry vermin. And when you simply need a good larp of a pink tongue to lift your spirits, the ubiquitous Labrador retriever makes a great barn dog. Of course, some so-called “off breeds” end up in the role of barn dog, regardless of whether they’re actually suitable for the job. 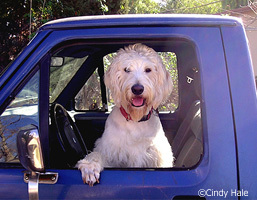 If you want to read about one particular un-barn dog, visit Cindy Hale’s Life with Horses blog to read one shaggy dog story: Barn Dogs Can be Oodles of Fun. Want to share your own doggie tale? We’d like to hear about your barn dog. Maybe you had a perfect pooch who traveled with you to shows or trail rides, and listened intently as you recounted the day’s adventure all the way home. Perhaps you once owned a benevolent bowser who was more of a tackroom ornament than a working canine. Or maybe your current barn dog deserves some honorable mention, simply because your horsey life wouldn’t be complete without your dog. Just click on Submit a Comment below, and howl about your barn dog. Well yesterday when I was eating lunch at the barn Bob was staring at me with his big brown eyes. Looking directly at me and his eyes followed the Cheetos from the bag to my mouth. A new neighbor came over to introduce himself. My German Shepherd, Kelly, chased him into the tackroom and wouldn’t let him out. Every time Jim would crack the door open, Kelly would rush him. Jim ended up spending an hour trapped in my tackroom before I got home and “rescued” him. Kelly and Jim are good buddies now, but we still laugh about that initial meeting. Our barn dog is an australian shepherd named Diesel. He loves to run and go trail riding with me. He is a great herding dog and helps bring the horses up to the barn from the pasture. My dog’s name is Joey. He goes everywhere with us! When we go for trail rides he always has to come along. I agree! Horses and dogs just go together- they’re my favorite animals! Great article. I love my horse and my dog. My dogs name is Sunnie and she is a 3-year-old Yellow Lab and she’s scared of horses, but she will walk/run right behind them and try to nip at them. I don’t bring her out to the ranch with me anymore because of this, but that’s because she wasn’t trained around horses. Labs will always be the best companion, no matter what! Dogs and horses are like peanut butter and jelly! Wherever you see a horse and rider you will most likly see a protective pooch bouncing along behind. Every horse owner I know has AT LEAST 2 dogs 🙂 I already know that when I get my own barn one day I’m going to have a Dalmation or Great Dane right there with me and my horses. My brother’s Jack Russell is probably the best barn dog I’ve ever seen. She’s not only a great ratter, but smart as a whip and fears nothing. It is funny as all get out to see this little dog pick up the lead rope and lead his 16+ hand TB around. With her attitude, she thinks she is 6 feet tall and Red seems to believe her. The dog at the barn were I board is just the cutest little thing. She is an English sheep herder. When the owner comes to let in stall boarded horse into the barn (he just opens the gate and the horses go to their stall) she runs offs and hides. It is really funny. Every time a horse gets near her she runs off. The bad news for her is that she is living on a horse farm! My trainer’s three dogs; Titan- German Shepard, Bruce- Mix Breed, Defuscy- Golden Retriever; are the best barn dogs ever. Their really helpful with taking care of the horses, for example; cleaning out the food stuck on the buckets we feed the horses with. Not only are the great in the barn, but the arena too! They make wonderful obsticles to ride around and often steal things you put next to the jumps. Those three dogs are the life of the farm. My barn owner has multiple dogs of all sizes, but the one that stands out is the oldest, a sweet litle Blue Heeler. She does everything-if a hook on a stall door in unlatched, she runs to the stall barks three times if it is stall three, or six if it is stall six, and that’s how she checks the barns every night. She’s been through thick and thin with the barn owner, and has saved him from multiple situations that he never stops talking about. She is amazing, and he loves her unconditionally. My (funny and)faithfull companion, Ben. He’s a 6 month old Golden Retreiver. He helps me bring a horse in by insisting that he take the lead rope and lead my horse in. He pulls on the rope until the horse starts moving and then brings him to me. When we get to the gait, he dosent want to give up the lead rope…lol, But he is still a puppy. I have a dog named Shiloh who is a German Shepherd x Rottweiler,who, though he doesn;t do anything interesting is one of the best dogs out there. when i go riding he’s right there to keep me company, he lets us know if someone’s coming, and all he asks for is love, a warm bed, and something to eat. Two years ago we took ownership of my Aunt’s dog Harry. Harry is a mix. Harry had always lived in the city. When dad brought him home they passed an Amish buggy and Harry started barking and going crazy. He did the same thing first time he saw our horses. This continued for about three weeks. He finally got used to the horses and now they get along well. They don’t have much contact though because Harry is in the kennel or tied most of the time. Once when harry was let lose to run he got to close to the horses and one of his teeth got kicked. We did not notice this though until several weeks later. Harry gets along well with our other three dogs as well and he is very friendly and a wonderful companion. My Aunt took him back once for a short period of time and he was dearly missed. We are glad he is now here to stay. When I was a teenager in New Zealand my family had an eye dog. They’re a unique NZ breed; a mixture of Border Collie and Terrier. I got my first horse, a two-year old OTTB filly. She was quite insane and we were in love. The first time I had to catch her in her 50 acre field there was no way I could even begin to get close. Pip, our dog, decided to help me. She rounded up Juniper, my filly, and brought her right to me. From then on Juniper was the easiest horse to catch. Pip was also great at hunting turkeys and bringing them home to us. She was one of those dogs that are eager to please and enthusiastic in any endeavour. I miss her. At the barn we have a ever faithful Akita/Alaskan Malamute that is about 12 or 13 years old. He is one of the sweetest dogs and once he knows you he will be your friend forever. He has some hip and back problems and severe arthritis but that does not stop him from play with the other dogs in the neighborhood. He will be put down soon. I am writing this as a tribute to one of the most faithful, friendly and amazing dogs on the planet and he will be missed terribly when he is gone. He will always have a very special place in my heart when he is gone. I love you Hyro to the farthest food bowl and back. We have a VERY old labrodory named Toby! She is the absolute sweetest, most loving dog! She was my dads dog, unforunatly I just lost my dad to diabetes. After that Toby became unhappy. So we did all we could to help her cope! Saddley it wasnt enuff until my sister got another dog named rex ( border collie/ mutt). After that Toby and Rex bonded as B.F.F’s! Soon after Toby was herself agin! I just wanted to dedicate this storey to my Dad’s dog Toby! Both my dad and Toby will ALWAYS have a specil spot in my heart! The boarding barn I ride it welcomes stray dogs with welcome arms. Any dog that wanders in and doesn’t bother the horses will be fed, watered and taken care off. The two original Australian Shepherds, Bonnie and Nibbles, have companiabely accepted these down and out dogs, and taught them the “bark at everyone who moves” routine. The only command they know is “get OUT of the arena”, and they have probabely been kicked in the head by a horse too many times to be capable of learning more, but they are still the most lovable companions and gaurdians a rider or horse could ask for. Hunter, the newest stray, was claimed recently. The stable manager noticed Hunter was reluctant to get in the car and was fearfull of his owner. He was back at the barn a few days later, so presumabely he is escaping an abusive home. Anyway, the barn is not only a home for horses, but a haven for many down-and-out dogs as well. Our ever faithful dog, Dodger, loves to go on trail rides. His favorite activity is running ahead, burying himself deep in a mud puddle and then springing out to “surprise” us when we approach. This usually only works once or twice and then the horses expect it. He doesn’t bark or misbehave, just springs out and runs to the next puddle! Our Bernese Mountain Dog Chauncey is fascinated with the neighbor’s barn cats. Well one night he was outside and caught sight of a cat and sprinted over to the barn the cat freaked out and climbed up the wall! The boarders next door were kind of freaked out because they did not know what came running into the barn but they thought it was really funny once they figured out it was Chauncey. At a day camp I went to a while back, there was an adorable Border Collie named Buddy. He was very cute and loveable! In fact, I wrote about him in my book, Mare on the Marsh! the owner of the barn where my horse is has 6 dogs…she has 2 rat terriers, a cute mutt, a great dane/rot mix, and 2 red dobermans! they are all very sweet and they like to race from one end of the barn to the other! There is nothing like a big full-of-life Boxer dog to accompany you to the barn each day. Buddie is the dog that the horses find incredibly annoying, for he is a loud mouth, but one they couldn’t live without, for his bright personality stays with you, even after he is gone. My barn has 3 dogs, one owned by the owner of the barn, & the other 2 owned by some of the stablehands. There is a big fat rottweiler who is very sweet & not at all mean (he has the cutest puppy dog face that can make anyone break!) there is an australian shepherd (he is always hungry & trys to steal the barn cats food) & there is Curly, the famous barn dog, anyone can see why he is named curly, he is an extremely fat & friendly (did I mention curly?) snauzer (did I spell that right? sorry if i didn’t.) The first time we saw him the groom asked us to guess his name. We looked at him & saw a majorly curly (yet extremely cute!) dog. “Curly?” we said guessing. And we were right. My instructor sometimes brings out her out of control black lab. His name is Charlie & he is very excitable & doesnt always listen, or stay still! But he is great entertainment since he is also a clutz. The barn wouldn’t be as fun without the barn dogs! A barn wouldn’t be complete without dogs. Iremember once at my old barn, my horse spooked and i came flying off. I landed on the fence and it really hurt! The barn’s huge, 180 pound great dane named Cooper saw I was upset. He wanted to cheer me up, so he came over and sat on me. Cooper felt preety heavy, but I coulndn’t help but start laughing. I used to have to labradoodles. One was the so calm, he would just sit there until I told him to get out of the barn. The brother on the other hand was so energetic you couldnt get him to sit still for anything. We had to kennel him up because he would go visit our neighbors cows and chickens! He would just keep exscaping everything I had. finally I moved the kennel into my large holding pen and put a cover over it. I watched him climb out of the top, and jump over our six foot fence! I would get so frustrated with him! But in the end i was happy he was the resident escape artist because him and his brother saved my sister’s life from a bear! lets just say they had a very nice dinner that night. the dogs at the riding barn i go to are as loyal as they come. They watch every car that comes threw the gate, giving it a thorough sniff-down/check. Once your (or you horse’s) feet are on the ground, their as soft-hearted as the ride’s winter coat. I used to own a mutt that would always sleep in my horse’s stall and at night she would jump up on my pail that I had in front of our stalls(the stalls resemble cow stantions)and eat my horse’s oats. Saddly since we live on a highway she got hit. I buried her the day after my horse died. I don’t think I will ever forget “Casey” aka “action” and how her short life could mean so much. One time when we brought my dog Diesel out to where the horse I am leasing is all of the friesians touched knows with him and then ran off bucking and kicking. My dog is really dumb sometimes, but he is always very protective and I know I can trust him to keep my horses safe! I have 3 dogs and they are wonderful at guarding the house at night. but, there is one problem. my dogs hate cats. So one night, I heard so much barking downstairs, I got out of bed. On my way downstairs I saw something that looked like a furry bullet shoot past my window. sure enough, it was a cat, and my dogs had scared the piss out of it! ( there was a puddle on the porch)That is the only time I have ever been so happy at three AM!!! my dog joey loves ponies. when hes happy he gives them a big lick across their face! The barn dog in my life is my trainer’s dog,a weimeraner named Dundee. He is so different from my own dog. The one time I bring him to the barn he pulls the leashfrom me runs into the pasture and swings on a 2 yr ol’s tail! Since then everytime I drive up the poor 2 yr old looks for that crazy dog!!! One of the best dogs we ever had was Jo-Jo (RIP) a blue heeler/austrailian shepherd mix. He was very protective of our horses and cats as well as small children! Whenever the neighbors black lab puppy would come over he would not let him near the other animals, he even got between him and a little boy once and wouldn’t let him near him! But if the other animals weren’t around then he loved to play with that puppy! One of our other dogs Ginger a Viszla loves to ride horseback and loves to hold on to the lead rope and lead the horses for us! On May 30th, 2008 we bought our 1st family dog. A 10 week old white blue eyed Siberian Husky, who we named Ripley (and for good reason…lol). My oldest daughter was taking riding lessons at Life Station (a local youth group with horses and other animals). So we took Ripley with us. They had just gotten two new horses. One was name Paige. She was very friendly and came right over. Ripley seemed interested in meeting her so I picked him up. He started licking Paige’s face and in return she started licking him back. Now every time we go out to Life Station Ripley seeks out Paige. Once they greet each other Ripley calms down and watches my daughter’s lesson (on Ripley’s second favorite horse Joshua). Our family belongs to a local horse & rider association. So whenever we visit our horse friends Ripley is in heaven greeting every horse who doesn’t mind a horse crazy pup. My two labs, Max a black lab and Buttercup a yellow one, are my best friends. They follow me loyally around all day long. Whether I’m doing my farm chores or are out riding, I know they are not far behind. The barn’s dog is Sparky, a Jack Russel Terrier. He’s so cute and friendly, but he has an interesting trait: he catches more mice than the cats do! He loves doing it, and he’s GOOD at it to! You don’t see anymore rats and mice in the feed room anymore! I own a Chocolate Lab named Lakota he makes my everyday chores fun and helps it go faster. He carries water buckets for me so instead of carrying four I can get five to their detonation with his help. He also helps me move our Miniature Stallions because they like to as I’m leading them to stop and scream and kick at the other stallions stall. Lakota stands about five feet behind them and barks and that gets them moving. He also does great on trail rides he listens like an angle. My first dog, HogDog, I got him for my first birthday, I had him til he was 12 and ran away to look for his mate that got chased away from our house by another dog, well he was my everything, he was my bestfriend, my listener, my toto when I was little and played Wizard of Oz, and the main thing my Doggie Pal… But now that he’s been gone for almost 4 years ='[ I have my Rocket puppy, a Great Pyranese, he’s the best one besides his mother and father, they go every where on the trails around home with me, they are the best dogs, friends I could ever have…. They make every bad day a good day…. We used to have a miniture pony colt and we had a black lab. One day i walked outside to feed the horses and my lab and pony were playing tug a war with a towel in the pasture! I have four dogs, two border colies and two great pryrenees. The border colies drive my horse insane by trying to herd her but my horse love the great pyrenees. The great pryrenees follow the horse every where when I ride and if the start to trail behind my horse will nicker to them to make sure they keep up! Angel, our dog, was afraid of Apache when we first got him. She saw him, crouched low, and ran between my legs and stay there. Now, their buddies. My Aussie Shepherds Tarrik and Reem love to help me tack up. Tarrik grabs the girth and Reem gets the martingale! My corgi Zoe likes to play fetch with the horse brushes, and the new Jack Russel puppy is learning- seems to like hoofpicks! Our faithful barn dog is a year-old yellow Lab. He is adoroble, but a bundle of mischief. He will eat anything, including flowers, gravel, anything expensive and important, and hay. Sometimes we will walk by the pasture and catch him grazing with the horses! My dachshund is a mouser. But he is also a very avid digger which can sometimes drive you a bit insane. Some of the workers at my barn get a real crack up watching him dig, they say he is making caverns. My mothers dog loves to try and give the horses kisses, right on the nose too, the horses get so confused they don’t even know what to do about it. There are so many dogs at the farm I board at you never see a horse freak out at a dog or vice versa. True harmony. I personally own a dog but shes not a farm pup. At the farm i board my horse the owner has two australian shepards and a worker always brings his two labs. On warm or cold days all four dogs could be found washing off mud in the water trough causing i and other volunteers to clean it again. When we would be cleaning it with the hose or filling it the labs would play with the hose and if we pointed it at them they either tried to chase the water or eat it. Another thing is at this place there is 1 sheep and a few goats and theyy would often chew through there pen so when we would go to round them up we would take the labs and sometimes if there master allows the australians and we would yell ‘get ’em’ then they would be off chasing the goats a few times the dogs would chase them right into the fences that we tie the horses up at and break the fence.the sheep is the one who usually broke the fence. the horses are so well trained they wouldnt budge, luckily no breakagee effected the horses or hit them. So in conclusioin the dogs there know how to keep the day fun and interested weather or not were riding horses. at times they would follow us on trail rides too. the dogs are the best barn dogs i have met! I love the dogs! These two dogs were playing with a ball and I threw it for them and they both tore after it. One of them got it, and brought it back to me; I threw it again. I couldn’t stop because they were so funny, even though I wanted to get back to grooming a horse. One of the barn dogs is always sleeping on a golf cart. Our barn dog brings so much character to the barn. He is huge, but is very gentle around the kids but still has plenty of personality. He goes to shows and wears a little “back pack” sporting our barn logo and colors, and we attach ribbons to it. He looks so proud showing off “his” winnings! I used to work at a barn where dogs were allowed. My boyfriend and I had just recently adopted a rescue who was a lab/beagle mix. Penelope was a little black dog (full grown at 50lbs), but seemed to not realize how much bigger the horses were than her. One day I couldn’t find her and turned out she had made friends with a black Holstiner gelding in our barn named Manhattan. The two of them would hang out together all day. To this day I’m not sure if Penelope thought Manhattan was a really big dog, or if Manhattan thought Penelope was a really small horse. While visiting my BBBF, we headed down to the pasture. We brought my pup, Rody, & her pup, Duke. Duke is always cased (playfully) my her horse, Maia.Maia was really truckin’ & all the sudden, Rody, who isn’t used to “wild” horses, runs to the house, & never goes into their pasture again! although he had no repect for horses he still enjoyed plaing around.Then there was Splash and sierra who would just watch us play around then Quin and Pumkin who would atept to herd the horses around! I have always had Boxers with the horses, and it seems that they have a knack for trying to “fit in”. Every one of them, as soon as they get near a grazing horse, they feel they have to graze too. Our youngest was just recently grazing and “chilling” with my mare as she was out grazing in the shade. Seems they make great horse pals :). We own 3 horses on our property and I have a dog, Pogo, a JRT who loves the horses, he will go out by them, roll in their poop, splash around in their water trough, and run around with them, all the while having this crazy I’m-having-so-much-fun-and-you-can’t-do-anything-about-it look! Oh my… Barn Dog… My barn’s Barn dog is Mo. Mo is a great-dane and alot of other breeds mix. Hes such a mess. My favorite story of him took place last summer. It was a very hot day and me and my trainer were sitting under a tree, watching a girl ride. There was a bucket full of water for the horse. Mo walkes over, takes a lick from the bucket and puts all for of his legs in! You can imagine a big puppy, in a small 18 gallon bucket!! I fell back in my chair i was laughing so hard! My barn dog is ellie! ellie is a 8 year old yellow lab who destroies every toy we get her. we sooned discovered that her in the horses get along wonderafully, and horse toys are nearly indesructable for her! Every time the farrier comes, he brings his cute little Welsh Corgie, Bailey. She will do anything to play fetch! You could throw a stick as far and high as you could and she’ll do a run and jump and catch it almost every time! Sadly you have to limit her play because she has hip issues. The greatest breed for a barn dog is a Great Pyrenees. They love all animals and are natural born guardians. Mine treed a bobcat in the barn.